Engine manufacturer ILO Motorenwerke was a major manufacturer of 2 stroke engines from 1911 until its decline in 1990’s. The company was founded by Heinrich Christiansen to produce 2 stroke engines at Altona, for many diverse uses. In 1923 to 1925 they also produced a range of motorcycles. In 1959 they where purchased by Rockwell international industries, who produced a range of snow mobiles, then later in 1977 they where acquired by machine giant Tecumseh. Under the Tecumseh brand they continued to expand production to supply engines for lawn mowers, compressors and agricultural items until the mid 1990’s. During there production history ILO produced, trains, all manor of engines but principally 2 stroke, (in fact in 1954 they where the largest producer of 2 stroke engines in West Germany with 184 000 units sold and over 1500 employees). 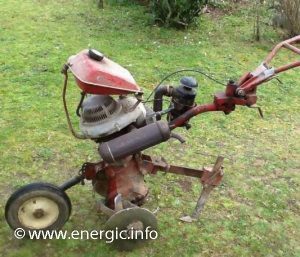 Energic used ILO engines in many motoculteurs, motobinuses and motofaucheuse machines of there day. And to there credit, with the strength and quality of these engines, many Energic machines survive and are in daily use throughout France today. Models such as the; Type 77L Motobineuse 3cv, 73cm3, the Motobineuse CLI 100 4CV 98 cm3, the Motobineuse 100 MVL CV 98 cm3 and so on. 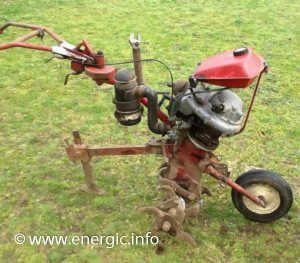 Energic motobineuse CLI 100 98cm3 ILO 2 stroke engine. Read about Energic Motobineuse CLI 100 using ILO engines/moteurs here. Read about Energic Motobineuse Rubis using ILO engines/moteurs here. Read more about Energic engseine/moteur supplier Bernard here.